Common job interview mistakes can easily be avoided using these good interview tips. These are the ten most common interview mistakes that employers and hiring managers complain about. They can be lethal to your job interview performance and cost your the job. 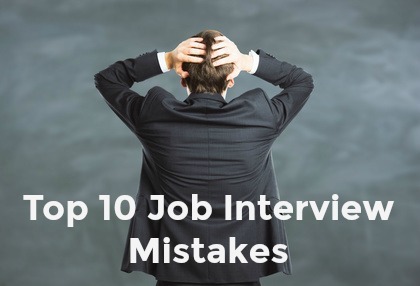 Taking some simple steps will help you avoid these mistakes in your next job interview. Not doing your homework and not preparing adequately for the interview beforehand shows you up as a disinterested and unprofessional candidate. The best way to impress your interviewer is to demonstrate your interest and commitment by referring to your company background research in both your interview answers and the questions you ask. Hiring managers state that one of the most common job interview mistakes that candidates make is dressing incorrectly. It is key to know the job interview dress code of the company where you are interviewing and to select your interview clothes accordingly. One of the worst job interview mistakes is to not be on time for the interview. The whole interview process is compromised as you will have to work very hard to overcome creating an initial bad impression. Collect all the necessary details beforehand to ensure that you arrive on time - directions, travel times, transport options. Make a practice run if possible to ensure you know where you are going and how long it takes. The first impression you make is crucial to the way the rest of your interview goes. Being unable to clearly articulate responses to the questions you face is a candidate's worst nightmare. Avoid this interview mistake by preparing and practicing your answers to typical interview questions beforehand. This will ensure that you are ready with the information you are asked for and you are able to present it confidently to the interviewer. Sometimes candidates do not understand the question and instead of seeking clarification they answer with the wrong information. Find out how to clarify interview questions that you are unsure of. Interviewers are unimpressed when they ask the candidate if they have any questions and the candidate does not! Having no questions indicates that you are not sufficiently interested and have not thought much about the position. You should arrive with a list of several prepared questions that you can use when necessary. You will want to find out certain details about the position as well as show the interviewer that you have done some serious thinking about the job and the company. Avoid making one of the most damaging job interview mistakes and have some insightful questions ready. Rambling on and telling the interviewer more than they want to know can quickly lose their interest. Make sure your answers are relevant and focused. 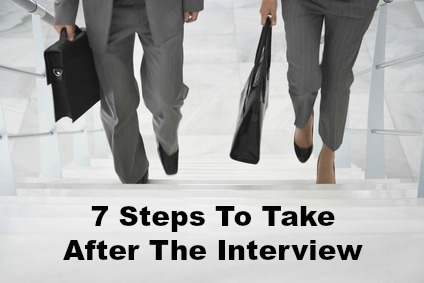 The best way to do this is to prepare and practice your interview answers beforehand. Confirm you have understood what information the interviewer wants by asking a clarifying question, such as, "Should I focus on ...". Listen actively to what the interviewer is saying to make sure you get the right message. This takes concentration and focus. 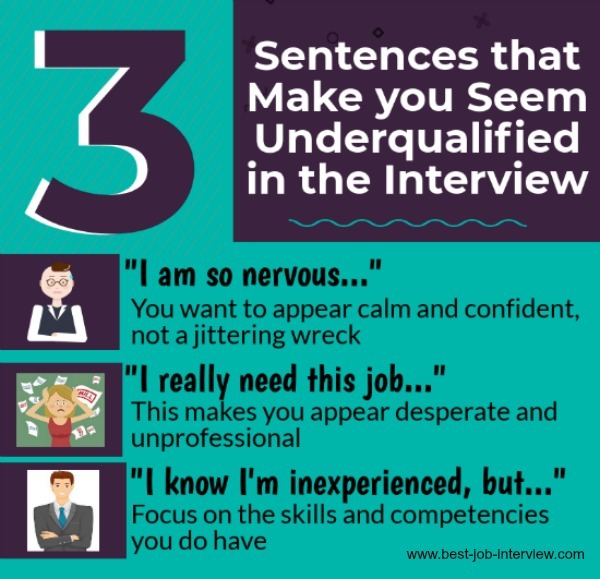 These tips for job interview communication will help you avoid this mistake. Inappropriate jokes can be a real job interview disaster. The rule of thumb is to avoid making jokes at this time. Nervous and anxious behavior can be off-putting and lead to job interview mistakes. It is important to overcome interview nerves and come across as confident and comfortable. Complaining about former employers and colleagues creates a negative impression. Disclosing inappropriate details such as the problems you had with a former manager and seeming defensive when responding to difficult interview questions, such as reasons for leaving previous jobs, also conveys a negative attitude. Focus on positive topics and achievements. Be enthusiastic about what you have learned from previous challenges and how overcoming problems has developed you positively as a person. Prepare job interview answers to tricky questions. Avoid fiddling with anything while you are talking or listening to the interviewer. We interviewed a candidate who tried to balance his pencil on his fingers, it kept falling off and, unbelievable as it seems, at one point he was scrabbling on the floor for it! It is important to close the interview properly and leave the interviewer with a good impression. Asking relevant questions about the hiring process, thanking the interviewer and leaving on a confident note all ensure that you will be remembered as a good job candidate. What should you avoid saying in your job interview? What should I do if I mess up in an interview? What should you do when know you have made mistakes in your interview and you want to put it right? Ask for a second chance. Email the interviewer thanking him or her for the interview, explaining what you think went wrong in the interview and requesting a second meeting. This interview checklist will help you to be well prepared to avoid job interview mistakes and win in your interview. Stop interview mistakes before they happen by using this mock job interview to practice before you go for your interview.